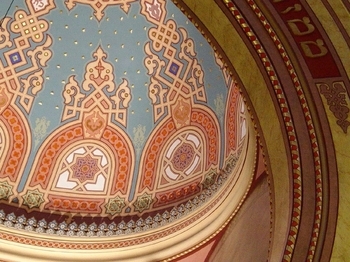 On Tuesday, we walked downtown and visited the Great Synagogue in the old Jewish quarter. It was really impressive. 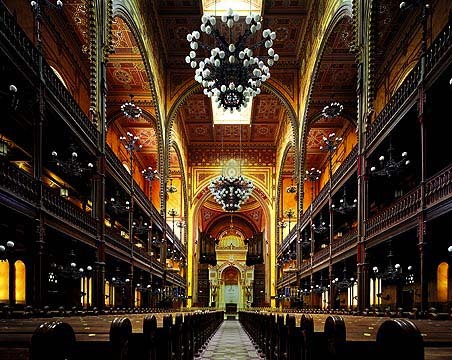 The synagogue, which is the biggest in Europe, was built in the 1850s, used as a stable and radio station by the Germans during WWII, and then repaired within the last ten years. Today I had to go to Hungarian class. There are about fifty students from the BSM taking the class, and they’re all really nice. The classes are great, too- Hungarian (dispite not being an indo-european language) is not quite as insane as you might think, with the exception of some of the more ancient words–ie ‘goodbye’ lit. ‘until we meet again:’ Viszontlátásra! What does Amerikai vagyok mean? Beautiful pictures! We can’t wait to visit! It means “I’m American.” The to be verb is pretty darn irregular, but the -ok suffix makes sense at least. These aren’t my photos, unfortunately. I had forgotten to bring my camera that day, and they don’t allow photography inside the synagogue. Oh well. What a beautiful place. Have you considered a career as a travel writer/photographer? Wow! These aren’t my photos, sadly. I wish I were that good! What a beautiful place you’re inhabiting! Have you come up with a yummy cabbage and tripe recipe? Is there a sizeable jewish community there now? Not much of one, I’m afraid. They were generally murdered during the war, but some remain–enough to run the synagogue and the kosher delis around it, at least. 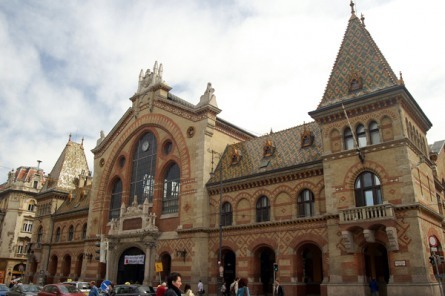 Wiki says between 50,000 and 150,000 remain in Hungary, a country of just under ten million, and probably most live in Budapest.